Why Small Business Owners no longer get 100% of the dividend they take from their company. Are you wondering why the dividend you used to pay from your small business is getting hit for tax. 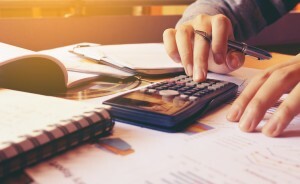 When the 7.5% tax on dividends was introduced in 2016, Small and Medium-Sized Enterprise Owners suddenly saw more of their income taken by HMRC. A £5000 tax free allowance was meant to soften the blow but in 2018 that is reducing to just £2000. Mark Telford explains how the tax man is now taking his cut of your allowance. Before the 6th of April 2016 if you took a dividend payment from your business and were a basic rate tax payer there was no additional tax to pay on this income. Under this system it was very easy to advise business owners of SME limited companies on the best way to minimise their tax liabilities; pay yourself a small salary -below the tax and NIC threshold – and then top up with dividends. This all changed on in April 2016 when a new dividend tax of 7.5% was introduced. It wasn’t all bad news though as a £5,000 dividend tax allowance was also introduced. This seemingly straight forward change in tax legislation has had a massive effect on the tax paid by thousands of small business owners who trade through limited companies. If you are a basic rate tax payer (total income not exceeding £45,000 in the 2017/18 tax year) then you have immediately moved from having no income tax to pay on your dividend to having an annual tax liability. In addition, you are also getting hit with the double whammy of payments on account. The easiest way to explain this is to set out the tax rates, the allowances available and use some case studies to demonstrate. What is the Dividend Tax Allowance reducing to in 2018? So for the 2017/18 tax year ending in April, your first £5,000 of dividend income is tax-free regardless of whether you are a non-taxpayer, basic rate taxpayer, higher rate taxpayer, or even an additional rate taxpayer. 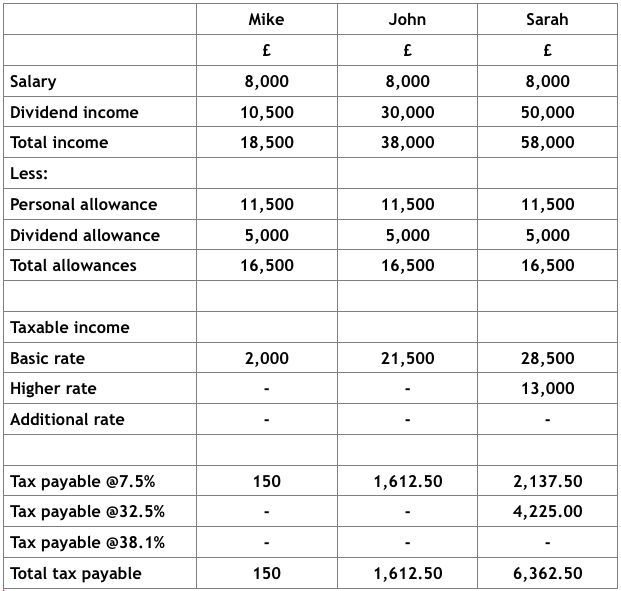 The technical bit is that the dividend allowance works as a nil rate band which means that dividends falling within the allowance are taxed at a zero rate (therefore received tax-free). However, dividends do count as earnings and will use up part of your basic or higher rate band. From 6 April 2018 the dividend allowance is going to reduce to just £2,000. Dividend income is always treated as the top slice of an individual’s income so if you haven’t used all of your personal allowance that can be used against your dividend income. For the 2017/18 tax year, this means that the first £33,500 of taxable dividend income which is within the basic rate tax band is taxed at 7.5%. Dividend income which is received in the higher rate tax band (income between £45,001 and £150,000) is taxed at 32.5%. 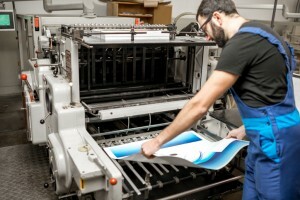 Up to the tax year ending in April 2018, Mike took an annual salary of £8,000 from his print business and paid himself a dividend of £10,500. His personal tax allowance is £11,500. His dividend allowance is £5,000. *( 7.5% of £2000 = £150). In the same period, John took an annual salary of £8,000 from his IT business and a dividend income of £30,000. His personal allowance is £11,500 and his dividend allowance is £5,000. This means that £21,500 of his dividend income is taxable at the rate of 7.5%. * (7.5% of £21,500 – 1,612.50). Also in this tax year, Sarah paid herself a salary of £8,000 and a dividend income of £50,000. Her personal allowance is £11,500 and her dividend allowance is £5,000. This means that £41,500 of her dividend income is taxable. and £13,000 at the higher Dividend Tax rate rate of 32.5%. Have you though about Payment on Account? As John and Sarah both have tax liabilities of more than £1,000 they will also be required to make payments on account for the following tax year. Payments on account are explained in another one of our blog posts. 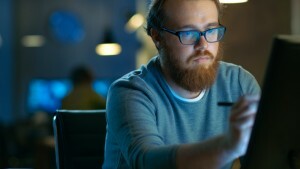 These are pretty straightforward examples of how the new UK Dividend Tax is affecting small business owners in the UK. 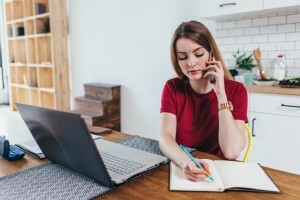 If you have additional sources of income, then the calculations can become a lot more complex. However remember, dividend income is treated as the top slice of total income for tax purposes. And remember, from April 2018, the Dividend Tax Allowance is reducing by a further £3000 to just £2000 which could make those decisions about what to take as dividend from your business and what to pay yourself as a salary even more tricky. 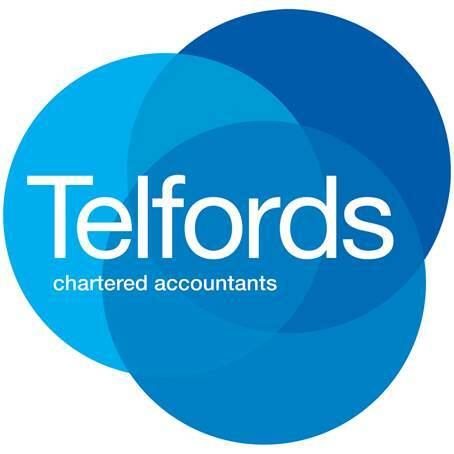 If you need help understanding or calculating your dividend tax or any other tax related matters, please get in touch with Telfords Chartered Accountants in Kent. We’re always happy to help small and large businesses whether you are local or elsewhere in the UK.